In The Category Of 'Fake News,' The Award Winner Is... : The Two-Way After postponing the announcement of the 'Fake News Awards' winners for a week, the president's event crashed the website of the GOP. The New York Times took first place on the list. President Donald Trump in the Roosevelt Room of the White House this week. 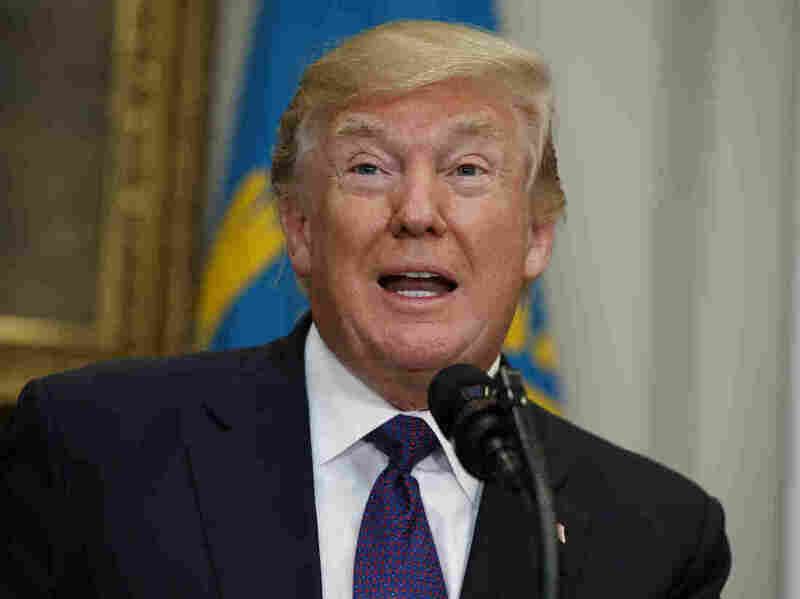 President Trump's long-awaited announcement of the "Fake News Awards" was temporarily delayed Wednesday when the website of the Republican Party, where the awards were to be listed, crashed. But the site recovered and the awards were unveiled. "The New York Times' Paul Krugman claimed on the day of President Trump's historic, landslide victory that the economy would never recover." "ABC News' Brian Ross CHOKES and sends markets in a downward spiral with false report." "CNN FALSELY reported that candidate Donald Trump and his son Donald J. Trump, Jr. had access to hacked documents from WikiLeaks." Other winners included Time magazine for incorrectly reporting that Trump had moved a bust of Martin Luther King Jr. out of the Oval Office; The Washington Post for discounting the size of "the President's massive sold-out rally" in Pensacola, Fla., in early December; CNN's editing of a video of Trump with Japanese Prime Minister Shinzo Abe making it appear that the president "defiantly overfed fish." CNN was listed two other times for stories about Trump's conversations with former FBI Director James Comey and the network's retraction of a story alleging that former communications advisor Anthony Scaramucci had met with a Russian. These were followed by a Newsweek report and another New York Times story. The president saved his last award, not for a specific new organization, but for his claim that there was no collusion with Russia, which he dismissed as a "hoax." "And last, but not least: 'RUSSIA COLLUSION!' Russian collusion is perhaps the greatest hoax perpetrated on the American people. THERE IS NO COLLUSION!" As the clock ticked down to the release of the awards list, there was considerable speculation that the awards wouldn't happen at all. Trump had first said that the awards would be announced on Jan. 8. Earlier in the day, in a speech delivered on the Senate floor, Sen. Jeff Flake (R-Ariz.) blasted the president for calling the press the "enemy of the people," a phrase first used by Soviet dictator Josef Stalin. "And, of course, the president has it precisely backward – despotism is the enemy of the people. The free press is the despot's enemy, which makes the free press the guardian of democracy. When a figure in power reflexively calls any press that doesn't suit him 'fake news,' it is that person who should be the figure of suspicion, not the press." And Trump himself tweeted that not all news is fake news.